Light energy behaves both as electromagnetic waves and discrete particles, measured in photons. Light is a form of energy known as electromagnetic radiation, which travels in waves. The distance between the peaks of electromagnetic waves is called the wavelength. The segment of electromagnetic waves that are most important to biological life is from 380 nm to 750 nm – visible light. Describing light as waves explain some aspects of its behaviour, but other evidence suggests it can behave as discrete particles, called photons. Pigments absorb visible light, with different pigments absorbing light of different wavelengths. The reason we see leaves as green is because chlorophyll absorbs red and blue light, and transmits and reflects green light. 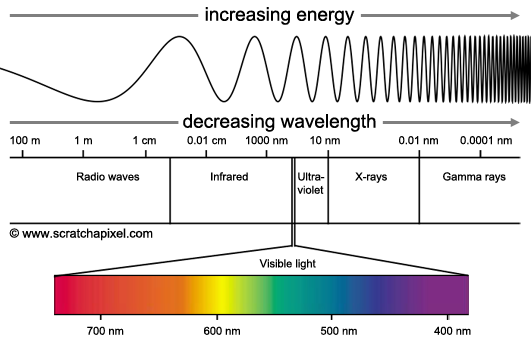 An absorption spectrum is a graph that displays the light absorption of pigment vs the wavelength of the light. It visually displays how well a pigment can absorb light of a particular wavelength. In contrast, an action spectrum displays the effectiveness of different wavelengths of light in driving photosynthesis by plotting oxygen release against wavelength. 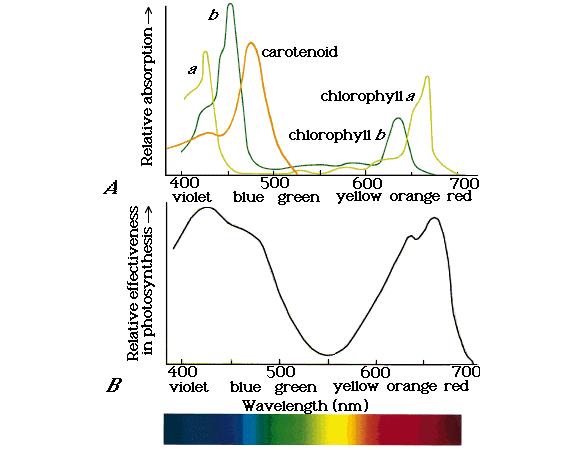 In plants, chlorophyll a is the pigment that participates directly in light reactions. It is supplemented by the actions of an accessory pigment chlorophyll b, and another group of accessory pigments called carotenoids. The differences in the absorption spectra of these pigments are due to small structural changes. Chlorophyll a is blue/green and chlorophyll b is olive green. Carotenoids absorb blue/green light and are therefore yellow-orange in colour. Carotenoids are involved in photoprotection – they absorb and scatter damaging light energy that could interact with oxygen, forming reactive oxygen species that are damaging to cells. What happens to light energy once it is absorbed? Light energy is converted into chemical energy during the light-dependent reactions of photosynthesis. The light-dependent reactions make ATP and NADPH, and the reactions take place in the thylakoid membranes of chloroplasts. When pigments absorb a photon, an electron reaches an excited state, which is a highly unstable and transient state. When the electrons return to a ground state, they release this energy, giving off heat and fluorescence. In the chloroplasts, the electron is transferred to another pigment molecule, beginning a chain of electron flow from pigment molecule to pigment molecule. Chlorophyll molecules are organised in photosystems. These photosystems are in the thylakoid membrane and consist of reaction-centre complexes surrounded by light-harvesting complexes. The light harvest complex consists of pigments. These pigment molecules absorb the photon and use the energy to energise electrons, which are passed in a chain from pigment molecule to pigment molecule in the light-harvesting complex. This happens until the electron gets to the reaction centre, eventually transferring it to the “primary electron acceptor”. This is the first step in the light reactions and is a type of redox reaction. Photosystems, come in two types: photosystem I and photosystem II. Briefly, light is absorbed in each photosystem, and electrons are moved from water and passed through each photosystem, producing NADPH. ATP is also produced. They work together to utilize the light energy that they capture to produce NADPH and ADP, by harvesting energy that occurs through linear electron flow. Photosystem II is named as such because it was discovered after photosystem I. When light is absorbed by one of the pigment molecules in photosystem II, the energy is transferred from pigment molecule to pigment molecule before reaching the reaction centre. Once in the reaction centre, the energised electron is transferred to a specialised pair of chlorophyll molecules called P680. The electron is now at a high level of energy and is passed to the primary electron acceptor. The primary electron acceptor receives the electron, and the electron in P680 is replaced by an electron produced by splitting a molecule of water (the molecule of water is split into two electrons, two hydrogen atoms and an oxygen atom). The oxygen finds another oxygen molecule, to form O2. This splitting of water is critical for producing oxygen that we breathe. The electron is then transferred from photosystem II to photosystem I through an electron transport chain similar to the one in cellular respiration. The transfer of electrons through the chain produces energy allowing ATP to be synthesized. Light energy is not only harvested by photosystem II, it is also harvested by photosystem I, where it is carried through a similar chain to the reaction centre, and joins the specialised pair of chlorophyll molecules here – P700. The primary electron acceptor in photosystem I then accept an electron from P700. This transfer of electrons to the primary electron acceptor means there is a space for new electrons in P700, and the electron from photosystem II is transferred here. Another electron transport chain occurs, and the electron is passed to NADP+, forming NADPH with another electron from the same process, and NADPH is formed. The ATP and NADPH are used to power reactions in the next stage of photosynthesis. An alternative route that electrons can take is cyclic electron flow. This pathway only uses photosystem I, and therefore only generates ATP. This is unusual in plants and is often related to photoprotection or some evolutionary adaptations.